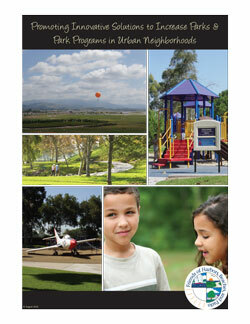 “Promoting Innovative Solutions to Increase Parks & Park Programs in Urban Neighborhoods” was released in August 2016. The report reviews three specific communities—Stanton, Garden Grove, and Westminster—where Park Scores were well below the recommended park acreage per thousand residents. The goal was to understand local park accessibility and sufficiency issues and to provide meaningful solutions to overcome the challenges. More than a dozen useful recommendations that can be employed even in the most park-rich environment were identified. This publication is copyrighted by FHBP, 2016. Reproduction can occur only with the express written permission of FHBP and credit must be given to FHBP.